Assuming markets hold together we may be near the end, perhaps even past the end of heavy tax loss selling. We may need higher metals prices for a hard bounce bit at least the "Chinese water torture" of prices slipping daily might be over. Assuming we don't torture the Chinese with yet more tariff threats. The most interesting development for me since the last issue is the return of anticipatory buying in some early stage stories. This is something you usually only see in a stronger resource market then the one we're now in. I'm happy to see it in a couple of HRA list names but I'll be happier still if it's the shape of things to come and not a one-off. As this issue was being finished, the SPX put in a closing lower low than October. It's just one day, and a holiday shortened one at that, but its not a good look. New York has now joined all the world's other major equity indices in being down year to date. I expected this drawdown and wasn't surprised or particularly dismayed when it arrived. I've assumed it would be a repeat of the one early this year which was scary but, ultimately, just another correction within a very long uptrend. I still believe that, though my conviction is much lower than it was a month ago. Why? Economic readings have weakened, though not dramatically. There is little indication, right now, that a recession is near at hand-though recessions often don't show in the data until well after the markets roll over. My concerns a month ago centered on market valuations and sentiment. And on politics, particularly ongoing tariff threats out of the US. Those concerns haven't lessened, yet. This pullback looks different to me than the February one. It's just had a lower closing low, which the correction in February did not. The most recent drops still seem very controlled and moderate on a day-to-day basis. 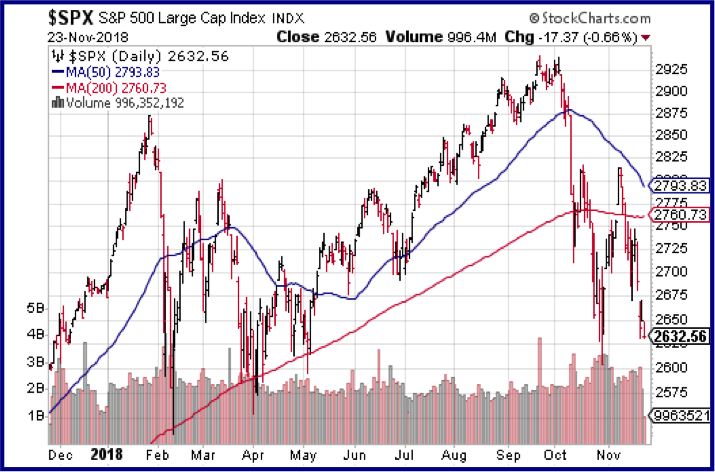 There is no sign of panic selling or a ramp up in volume that you would expect if the market was capitulating. I'm sure we'll get that at some point, but the market will be lower when it happens. Another thing that is different this time, in fact, different from just about every other pullback in this long US bull market, is the behavior of the famous "FAANG" stocks. These companies, and a handful of other, mainly tech, stocks have had an outsized impact on the SPX for years. Indeed, whenever we saw a quick bounce after a drop in the S&P lately, it was almost always led by hedge funds and retail investors buying the dip on FAANG stocks. Not this time. Facebook, Apple, Amazon, Netflix and Alphabet (Google) are 38%, 26%, 27%, 39% and 20% off their 52-week highs, respectively. Four of the five FAANG stocks being, officially, in bear markets is NOT something that happened during the last few pullbacks in New York. Maybe we get some bullish catalyst tomorrow, but this feels different. The last few times the SPX had a correction it was often buying of FAANG stocks that turned things around. We're not seeing that yet this time. Speaking of different, if you want to see a market that really hasn't gone according to plan, look at the chart below for benchmark West Texas intermediate crude oil. That is one ugly chart. So ugly, in fact, that its hard to believe we won't see a bounce fairly soon. Sentiment in the oil patch is terrible, ironic in a sense because the current price action is more of a "supply good news story" than a "demand bad news story". That doesn't help oil producers bottom lines though and they still impact both the Dow and S&P indexes. 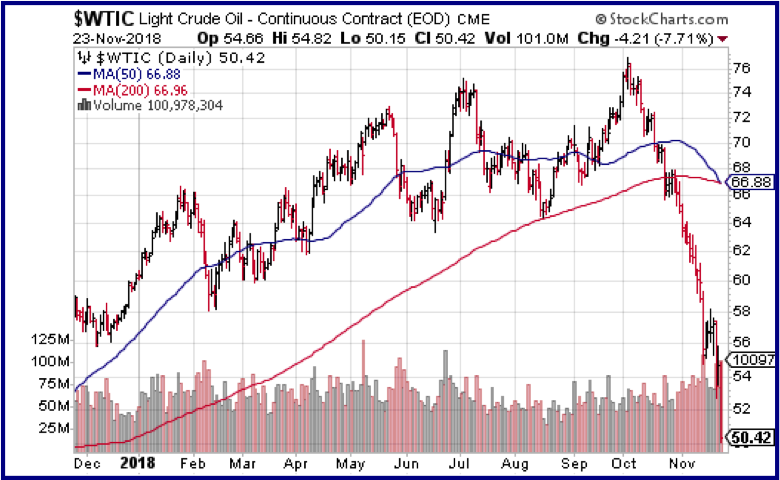 Lower oil prices are close to neutral for the US as it produces an excess now, and should be positive for most developed economies, except Canada. It's the US creating the surplus. It will be tougher for the Saudis to cut production to balance supply. They have a (well-deserved) PR and political nightmare to deal with and the US President that is one of their few friends is cheering for lower oil prices. 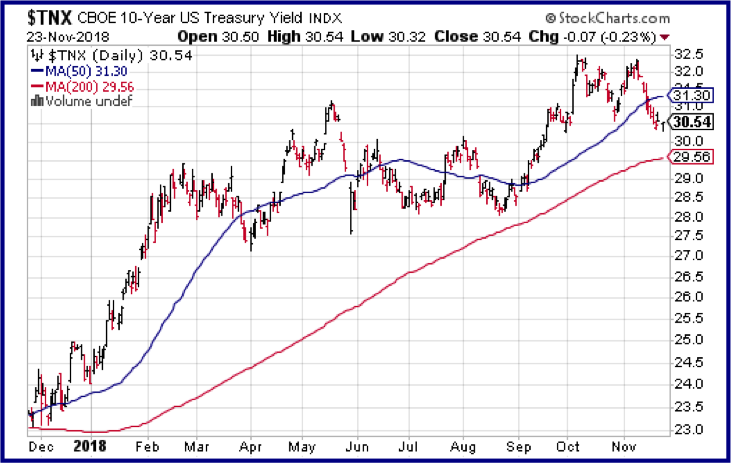 One bright note that hasn't, but still may, help cushion things is the drop in bond yields. You can see from the chart on this page that traders moving into bonds as a safety trade pushed yields back down to start of October levels. The surge in bond yields kicked off this equity market pullback. There has been a lot of talk recently about how the drop in stock prices would lead to the US Fed pausing on raising rates, something they are expected to do again at the December meeting. Based on bond futures pricing, the perceived odds of a rate hike next month have dropped from over 75% to about 55%. There has been some weakening in US stats, mainly those tied to capital investment and real estate. It seems that the boost in investment that the US corporate tax cut generated was very short lived. If those trends continue they may start to impact the Fed's thinking, but I don't think we're there yet. A couple of recent speeches by US Fed governors have includes comments about rate decisions getting more "data dependent". I haven't seen that wording for a couple of years and, frankly, I'm surprised to see it return. Alan Greenspan caught plenty of flack, after the fact, for worrying too much about stock prices. The "Greenspan Put" went from being part of Greenspan's "Maestro" myth, to the object of scorn and source of dangerous bubbles. I think the later view was the right one. So have subsequent Fed Chairs that have gone to great lengths to insist they won't be swayed by equity prices. Is that true? It hasn't really been tested yet. If we see another 5-10% in the current down leg we'll find out if the Fed can keep from blinking. In the next three weeks there will be three things that could have a big impact. First the G20 meeting. Those are usually meaningless but the next one won't be if the US uses it to ramp up its tariff threats on China much as VP Pence jus used the ASEAN meeting. Wall St will not be happy if the 25% tariff threat returns. Next up will be the non-farm payrolls. As always, it's the wage gain numbers we need to watch. A boost in hourly wages in the September report kicked off the surge in bond yields. Another big wage gain number could spook Wall St again and wouldn't help gold prices either. If neither of those events has a big negative impact, I expect the Fed to raise rates again December 19th. The wording of the release and new dot plots will be important. If the language and dot plots are more dovish, it will be a boost for gold and commodities. If the wording is dovish AND the Fed doesn't raise rates, I'd expect gold prices to go crazy. Again, I don't consider that the most likely outcome but it's a possible one if the payroll report and other stats ahead of the meeting weaken enough. Gold has held up in the face of a fairly strong USD index. It's enough to allow for some bullishness in discovery stories. Those, and cheap developers will continue to be the HRA focus. A few early stage plays have come back to life which is a positive sign for 2019. Let hope one of them works. ©2018 Stockwork Consulting Ltd. All Rights Reserved.